Kokyudosa is an exercise done in many aikido classes. So far as I know it is not much done in most Tomikiryu classes but there is a form of kokyudosa that we play with sometimes in our classes – we just don’t usually call it by that name. I have been thinking about kokyudosa lately because it is one of Kristof’s rank requirements when he returns to Ukraine next year so he asked me to work with him on it. 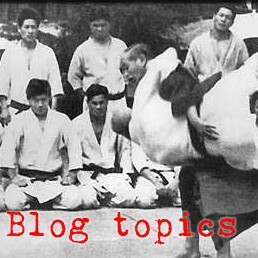 In its basic form the way most aiki classes do the exercise, uke and tori are seated facing in seiza about 2 fists apart. 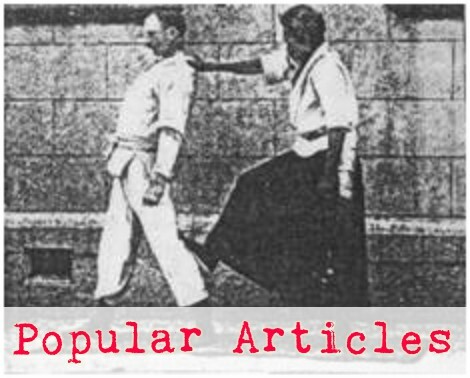 Uke grasps with ryotedori and tori attempts to blend with the grasping attack in order to push uke over sideways. This exercise can range from trivial with a compliant uke, to nearly impossible with an uke that clamps on and adjusts to tori’s attempts. In most aiki classes that do kokyuho, the game progresses from suwari ryotedori to standing attacks, including morotedori and ryotedori. Often kokyudosa looks identical to other techniques like tenchinage, but the emphasis of this game is very much on feeling and blending and not so much on some goal, like busting uke. We almost never play the suwari variant of the kokyudosa game but we do play with a standing variant as an introduction to hand randori. In our flavor of kokyudosa, partners stand just inside maai and uke grasps lightly with ryotedori. Both partners relax and tori gets one “free move” to unbalance uke. Tori moves anywhere offline and uke feels the offbalance grow until he is forced to take a step to recover. During uke’s recovery and every uke step afterward, tori moves to match uke’s motion and retain the offbalance. At this point uke and tori are hopefully close to perfect synch, meaning that there is little relative motion between their centers of gravity. This is where this exercise starts looking like kokyudosa. As uke is trying to recover balance he will unconsciously start moving his arms. He can’t really stop from doing this because he can’t keep from applying uneven forces to tori through his arms as he moves. If tori blends with these arm motions then uke will fall prey to numerous things that resemble techniques, like tenchinage. Once students are comfortable with this form of kokyudosa, hand randori is a natural progression. We simply expand the kokyudosa rules to allow uke to let go of tori’s arms and attack however he wants. We also allow uke to switch roles with tori if he can.